Thank you for choosing Jump Start Gymnastics & Kids Activity Center to host your Child's Party! Please click on the date you would like to book and complete the form. Only green times are still available to book. Yellow times have already been reserved. Pricing starts at $185 and then is based on number of children that attend your party. We count the children the day of the party so you only pay for those that come. The birthday child is included in that number. A $50 non-refundable deposit is required at booking. Balance is due the day of the party, by cash, check or credit card. We accept Visa, Mastercard & Discover only. Bring the MAGIC of Disney to your child’s Birthday party! Have a Disney Princess and/or Prince come to your child’s party at Jump Start Gymnastics! Watch your child’s face light up as their favorite Disney character walks into the room! That moment is priceless and will be remembered for a lifetime! - Best of both worlds: meet & greet and story time packed in one! 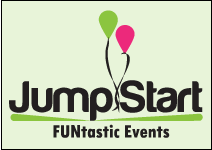 Jump Start also offers party hosts the opportunity to book additional instructors. Please call us at 309-692-5867 to discuss adding these options to your party.